Hi, my name is Mia Smith, I am 13 years old and in the 8th grade in Howitt Middle School. I am one of four sisters and a daughter of a stage three breast cancer survivor. I began a fundraiser, Make “Cents” Out Of Breast Cancer, Together We Can Make “Change” in 2014 when I was in the 4th grade and I wanted to help those fighting this terrible disease to become a survivor like my mom. I went up to my principal in October, Pinktober, Breast Cancer Awareness Month and ask him if we could do more to acknowledge this terrible disease that one in eight women are diagnosed with each day. Mr. Febbraro loved the idea and said he would work alongside of me and that year Make “Cents” and Pink Out Day was born! The first year on Pink Out Day we raised $750.00 and my classmates and I made gift baskets and notes of support and happiness for patients receiving chemotherapy at Memorial Sloan Kettering, where my mom went for her treatments. The following year, I began planning on making my fundraiser bigger and better. October 2015, we turned my one-day fundraiser into a month-long initiative, placing containers in each class, where students and staff could donate their CENTS to make CHANGE. Even more, we planned another Pink Out Day and I invited Gloria Gaynor, she attended and sang “I Will Survive” After Ms. Gaynor joined us and spoke to my classmates about how to face adversity and generously offered to match whatever our CENTS would be. Her match brought our total to $7,200.00. I could go on forever because I am so proud of all that I have accomplished and so proud to be a daler because they helped my campaign each year get bigger and bigger. My single day elementary fundraiser turned into a month long, district-wide program that went nationwide and is now totaling, after this year’s donations, over $20K raised. Over the years Billy Joel donated amazing concert tickets to raffle off, last year I received a shout out video from Ed Sheeran. Donations from Michael Carbonaro sent us tickets and merchandise basket to raffle and what may be the most heart-warming is that our community has come together, year after year, to help and support me with the one goal to be the end of breast cancer. This year was a great success! 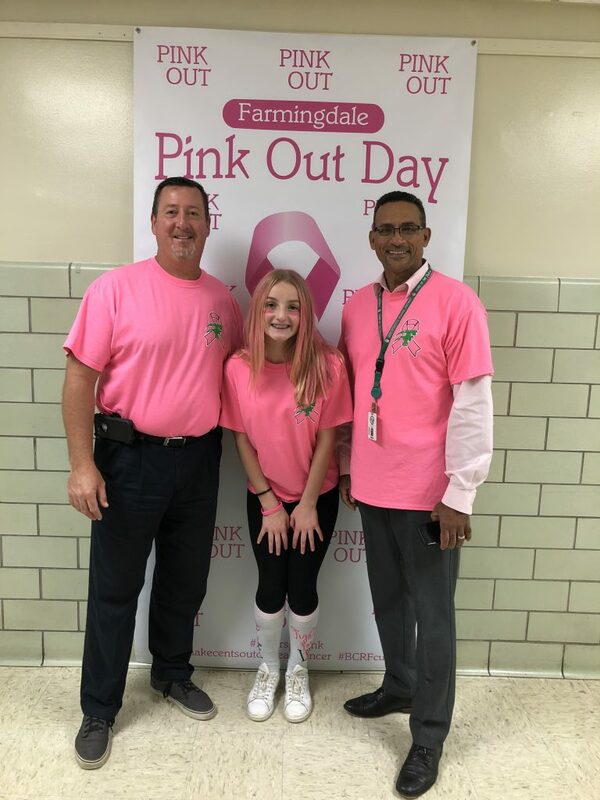 We had other schools that we inspired to join us on Pink Out Day, PS 682, Brooklyn, NY, Gladwyne School and The Shipley School in Bryn Mawr, Pennsylvania. they had their school wear pink and set up boxes for Make “Cents” Their donations go directly to BCRF under my Make “Cents’ page. To kick-off my fundraiser this year, I asked my cousins who own a hair salon in Long Beach, NY, the Chop Shop, if I could set up a Make “Cents” jar for loose change at their desk and they said, “Of course!” and on October 7th, they had a Cut-A-Thon and the amazing women came in on their day off to provide women and men cuts, blowouts and pink hair extensions. Each lady provided a gift basket to be raffled off along with a new pink beach cruiser generously donated by the Local Cycles. All the days’ profits went to my fundraiser. Friday, October 26th with the help of our Athletic Director, Jeanne Berkoski, we had our 2nd Make “Cents” table set-up at Farmingdale High School’s Pink Out Football game. We had several baskets to raffle off and baked goods, we had pink ribbon footballs and the players, cheerleader and the kickline teams wore pink, as did the spectators. It was a sea of pink under the Friday night lights! Wearing pink on Pink Out Day certainly helps make a difference to those fighting breast cancer. Unfortunately, everyone knows someone who has been affected by this terrible disease. Together we are making Change!